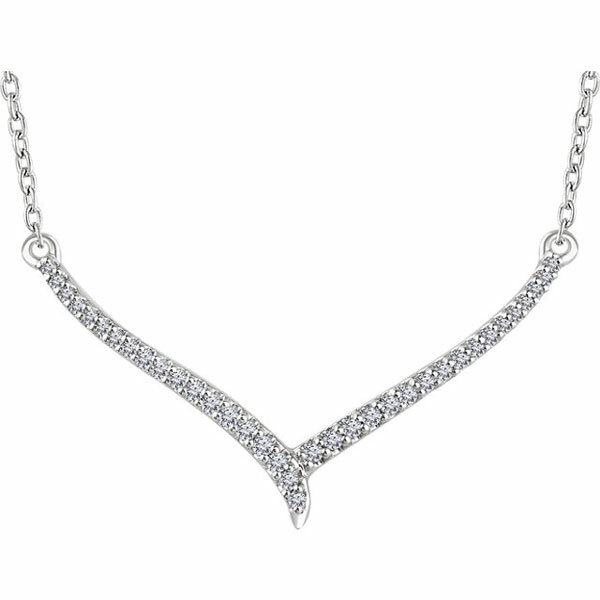 Beautiful sparkling diamonds steal the show in this 14K white gold 1/6 carat diamond "V" bar necklace in 16" - 18" lengths from Apples of Gold Jewelry! 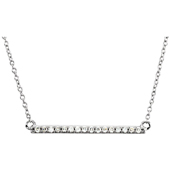 The beautiful 14K white gold bar necklace is a V shape, with diamonds covering the surface of the V. The diamonds are 1/6 carat (0.15 carats), and rated H for color and I1 for clarity. Measuring 1 1/4" wide b y 11/16" tall, this necklace is the perfect choice for that special occasion! The white gold and the diamonds really come together to create a favorite look. The 1mm cable chain has a spring-ring closure, and is available in your choice of 16" or 18" lengths. 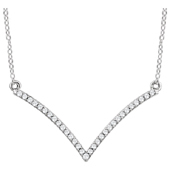 We guarantee our 14K White Gold 1/6 Carat Diamond "V" Bar Necklace, 16" - 18" to be high quality, authentic jewelry, as described above.